Carin started dancing at the age of seven and has continued for almost 20 years. 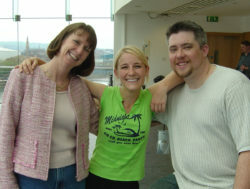 Carin’s love for Irish dance started while enjoying an Irish Festival at the Seattle Center. It wasn’t until the age of 12 that she invisioned the possibility of becoming a professional dancer when she was a guest performer with Trinity Dance Company. Her teenage years were filled with dance class and competitions in many different states.